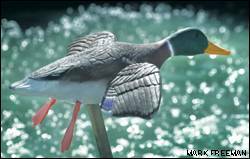 They are so-called "roboducks," electronic and battery-powered duck decoys that can flap their wings or swim in programmed patterns — all intended to convince other ducks that it's safe to land. One study claims the motorized decoys can make hunters as much as six times more successful than they would be using the traditional decoys. Pennsylvania already banned the robot decoys, and California has limited their use to the second half of the season. But these lifelike decoys are bringing the whole techno-hunting world into the crosshairs. "Think about a robotic hen turkey decoy that gives lifelike movement as you're calling," said Ron Anglin, the former top Oregon Department of Fish and Wildlife official who is now a state biologist in the duck-hunting mecca of Klamath Falls, Ore. "That could be enough to really tip the edge." Consider a blacktail doe decoy that wiggles to bucks in the rut. How about a life-size bull elk bugling a challenge to the bull of the woods? All would be legal under current Oregon rules, but are they ethical?